We Contemporary, Italy-Ukraine. 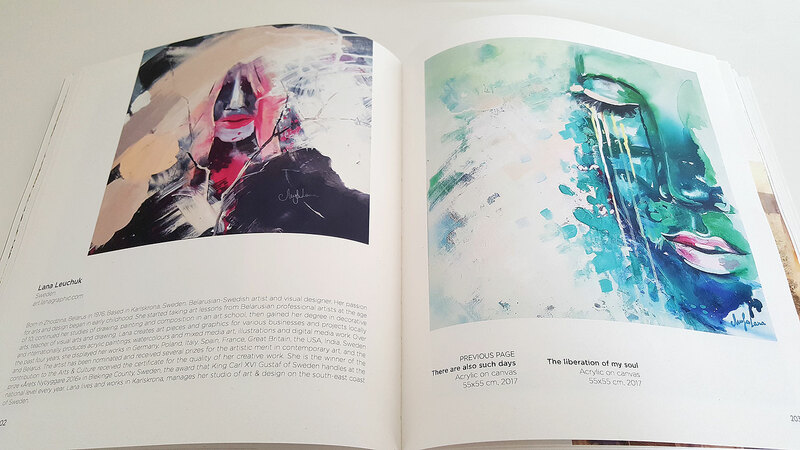 International art volume The Faces of Contemporary Art by Musa International Art Space, pages 202-203, 307. 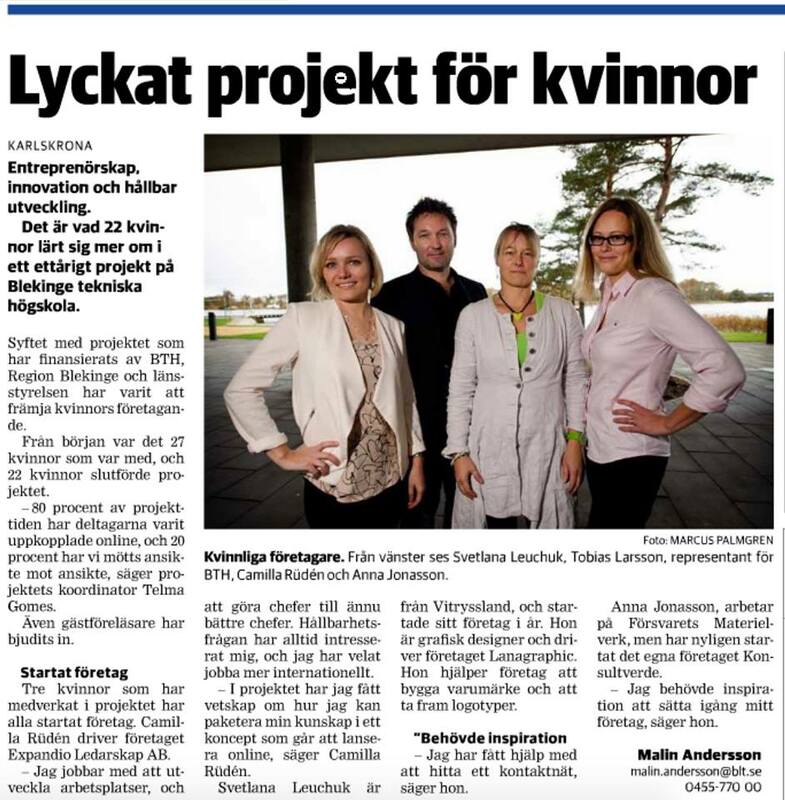 Blekinge Läns Tidning, Sweden. 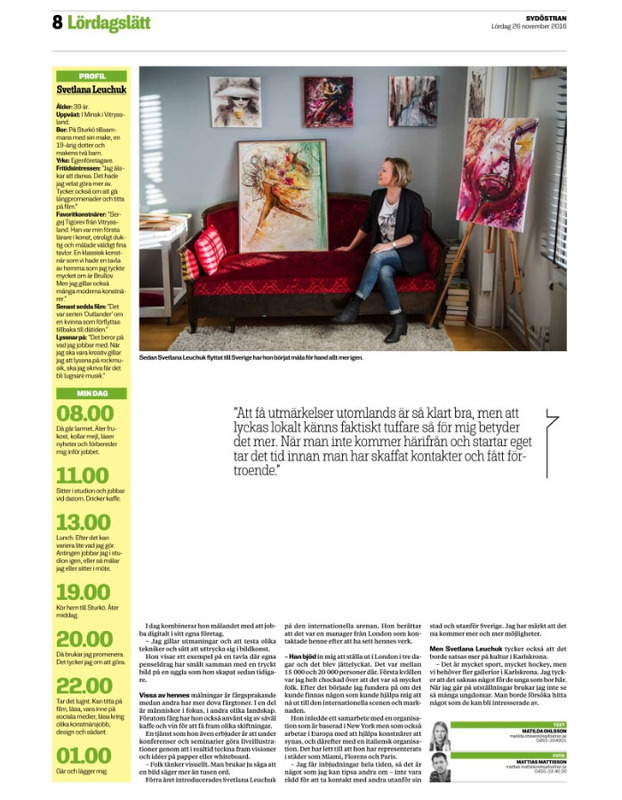 International art in Hoglands. Spotlight Magazine, France. Issue 8, p. 47. The International Prize of Nations Tribute to Tiziano, Venice, Italy. The official catalogue dedicated to Tiziano’s artistic talent and following to the piece the publication of artist’s artworks, selected by the jury, page 65. 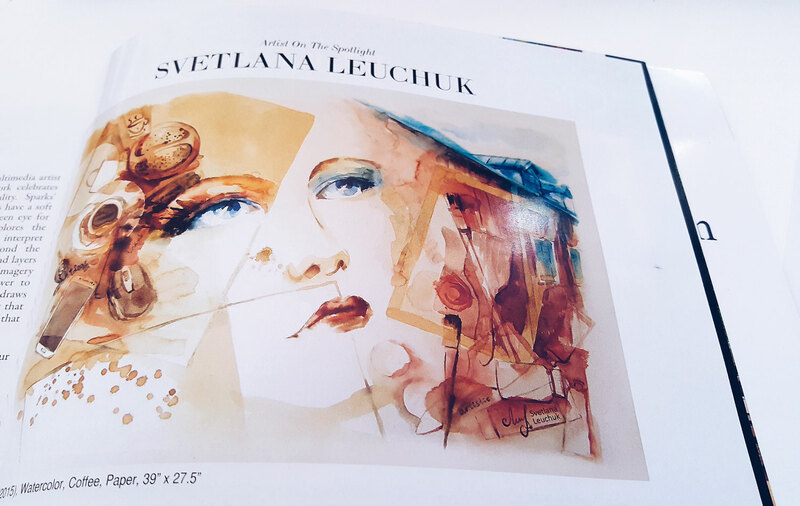 Art International Contemporary Magazine, March-April, page 116. Circle Foundation for the Arts, France. 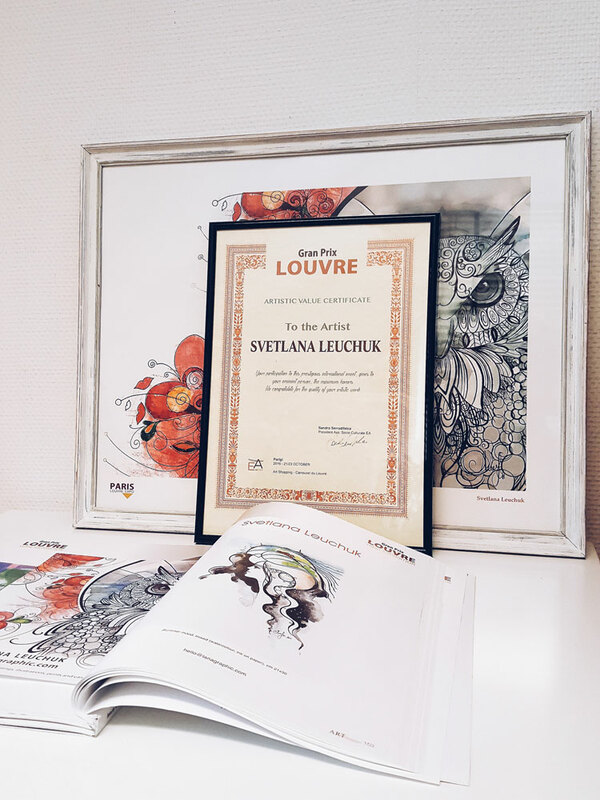 Swedish Illustrators & Graphic Designers 2018, Illustratörcentrum, Sweden. Itsliquid, Italy. Luca Curci talks with the artist Lana Leuchuk during the ANIMA MUNDI festival in Venice. 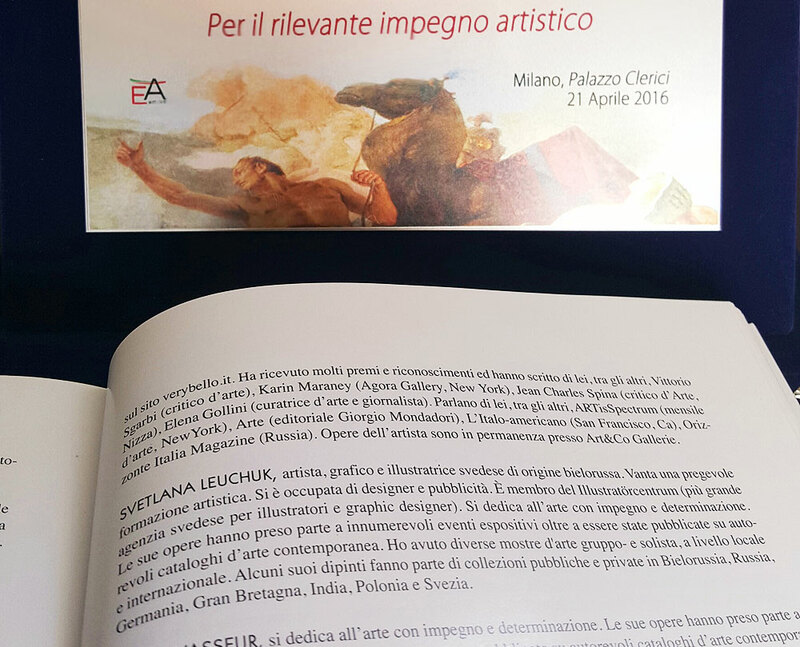 Francisco Goya International Award book, Italy. May 6th, page 24. 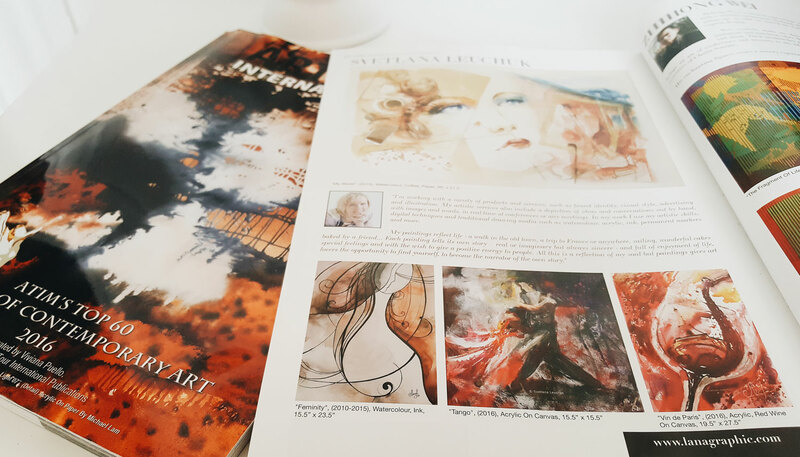 Art International Contemporary Magazine, May-June, page 55. 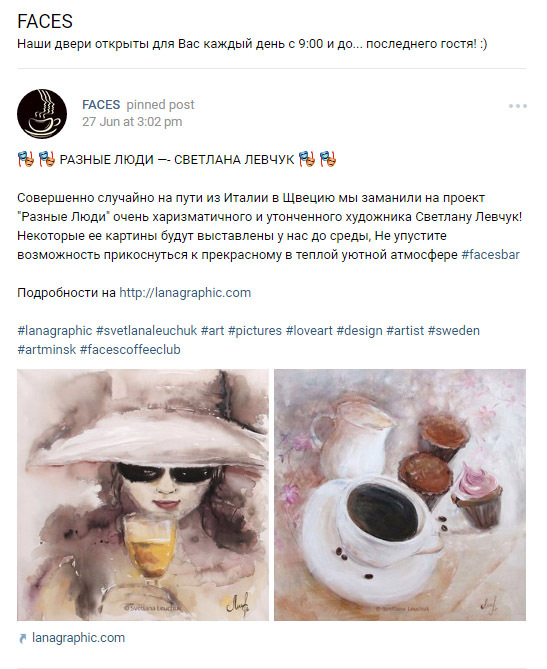 Featured in the blog of London based community and an international luxury interiors network TRENIQ/Lanagraphic Art & Design. 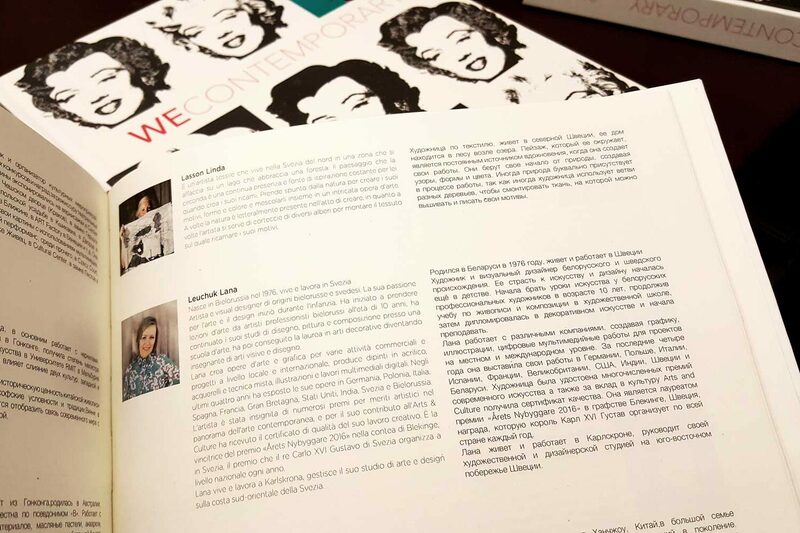 Biennale de Arte Peschiera Del Garda catalogue, Italy. Read L’Arena. Sydöstran, Sweden. 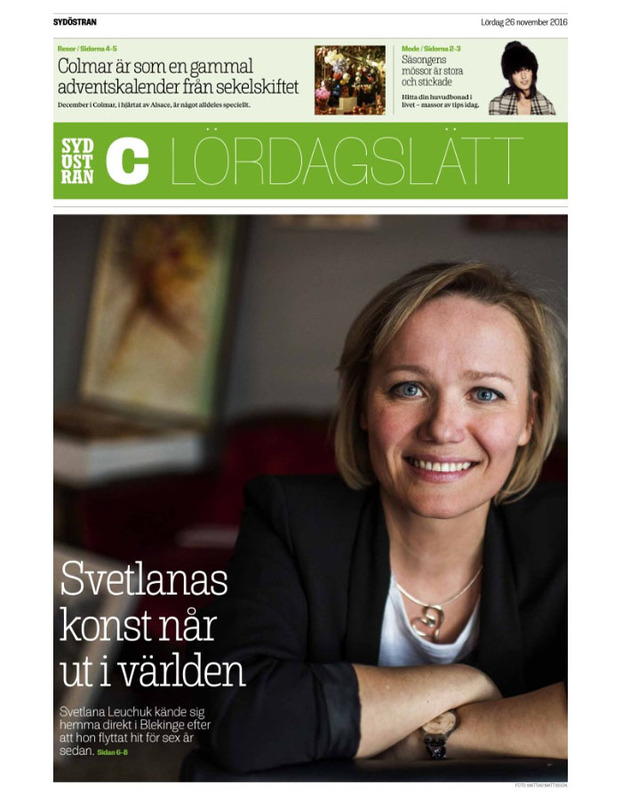 «Svetlanas konst når ut i världen», 26 November 2016. Contemporanei nella città degli UFFIZI, Italy. 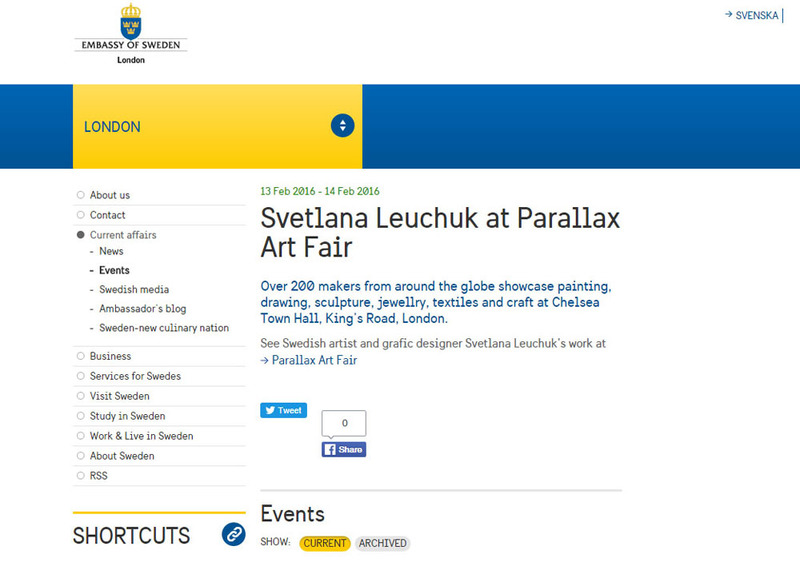 Artwork by Svetlana Leuchuk and art review by the critic Sandro Serradifalco. Art International Contemporary Magazine, November/December. 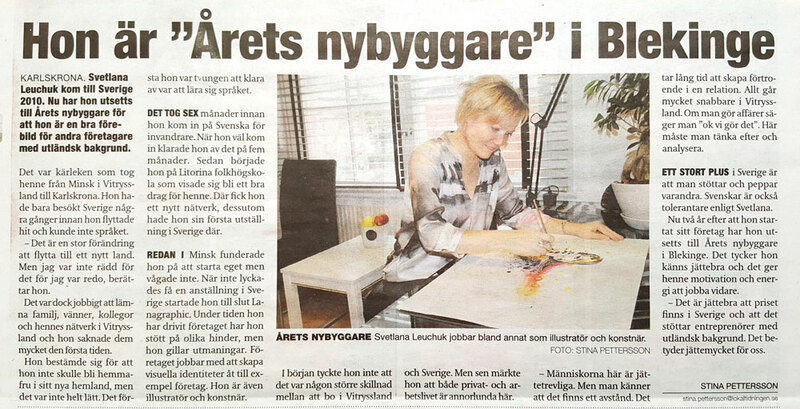 Blekinge Läns Tidning Sweden. 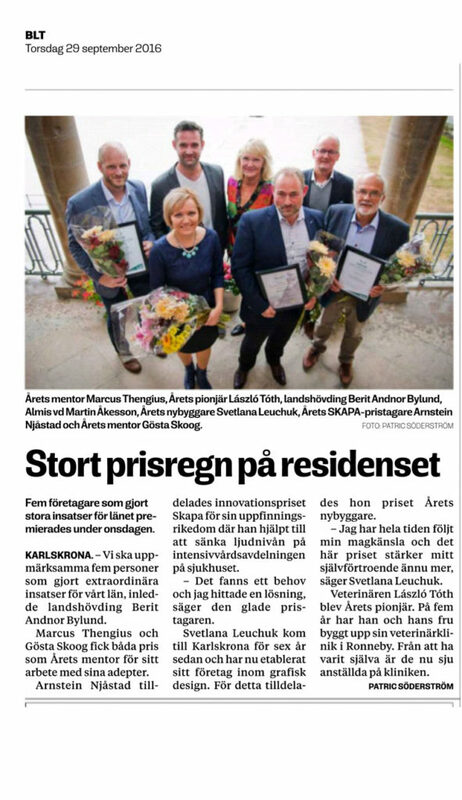 «Stort prisregn på residenset», September 29. H. M. King Carl XVI Gustaf’s Price Årets Nybyggare. 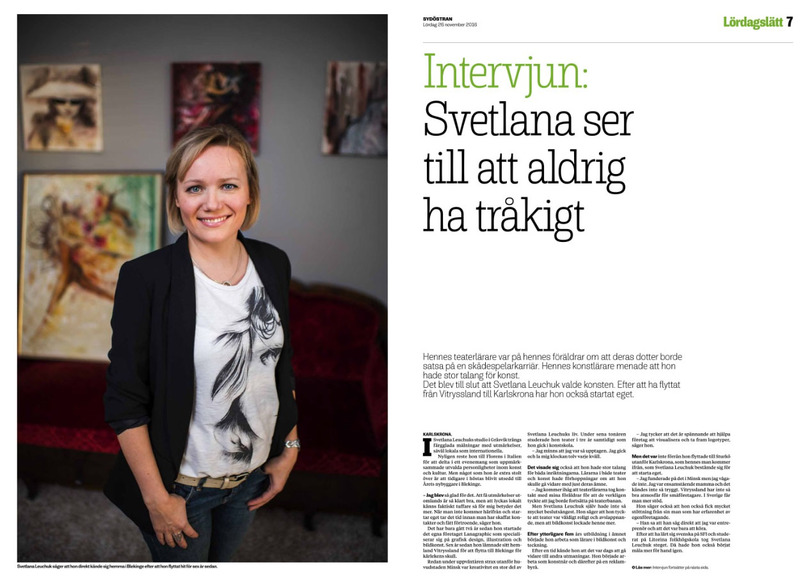 «Svetlana Leuchuk is a winner of Entrepreneur the Year in Blekinge». Art International Contemporary Magazine, September/October. 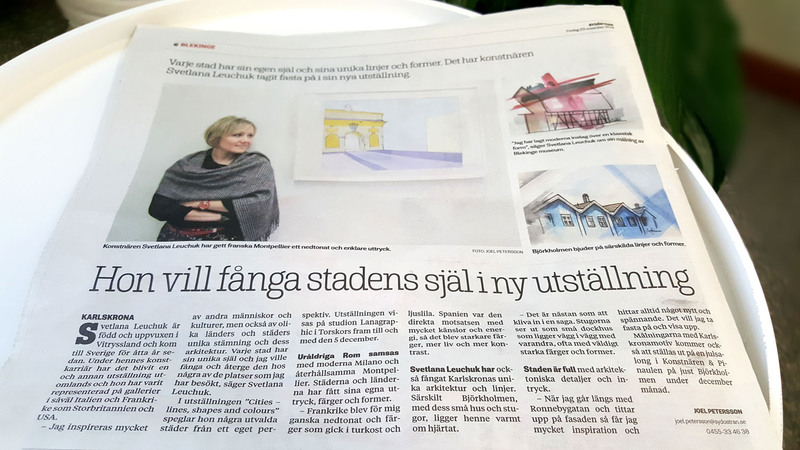 Sydöstran, Sweden. 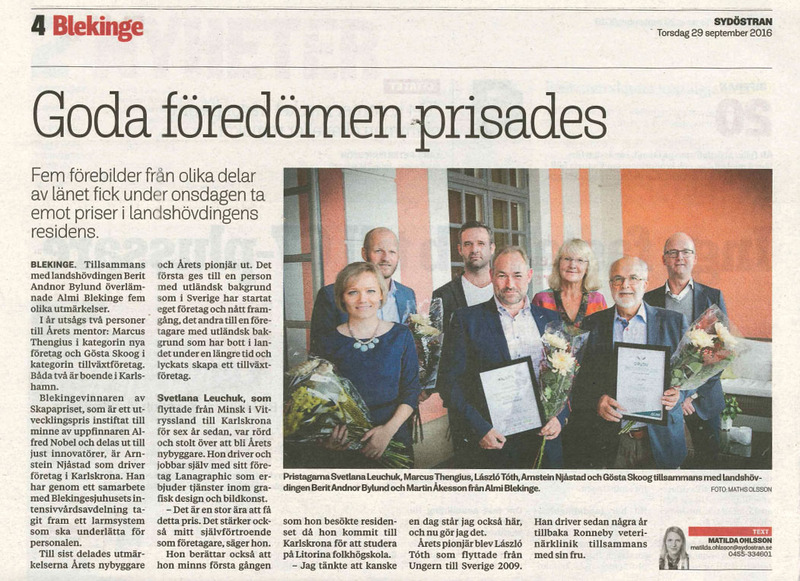 «They were awarded the prize». Голас Радзімы, Minsk, Belarus. «Творчасць уражвае святлом і лёгкасцю», September 1. Toscana Cultura magazine, Italy. 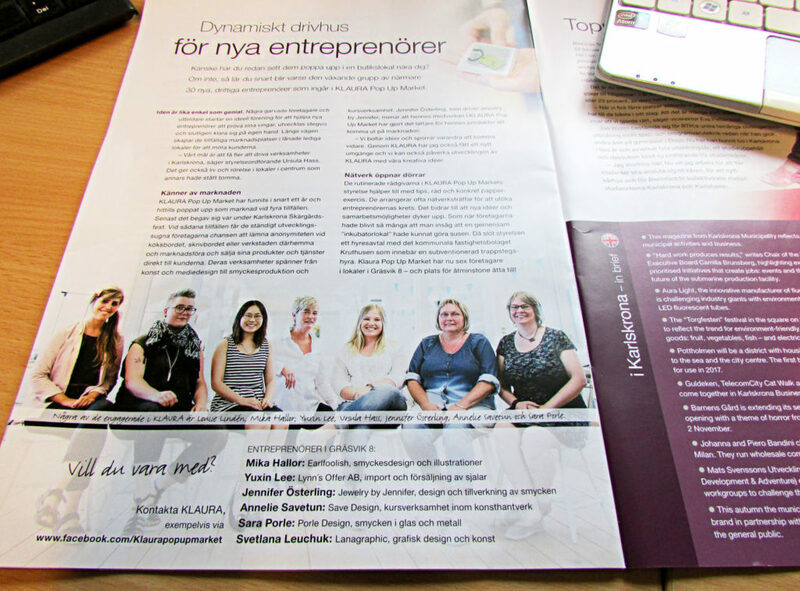 July Issue. 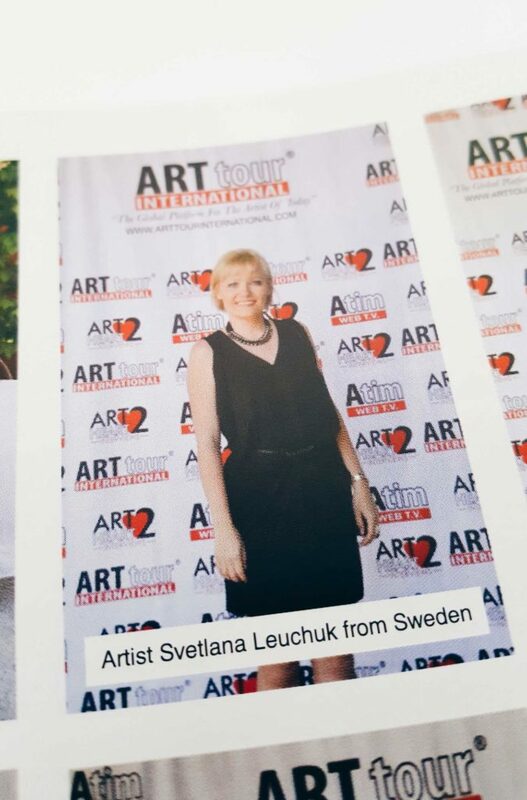 ArtTour International Magazine, New York, USA. Featured Artists, July 15. ATIM’s Top 60 Masters of Contemporary Art, New York, USA. Read the release here. 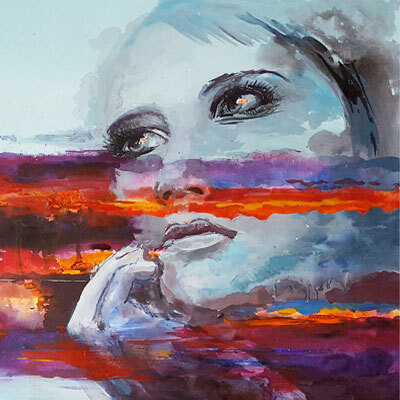 Premio Internazionale Tiepolo Arte – Milano, Italy. 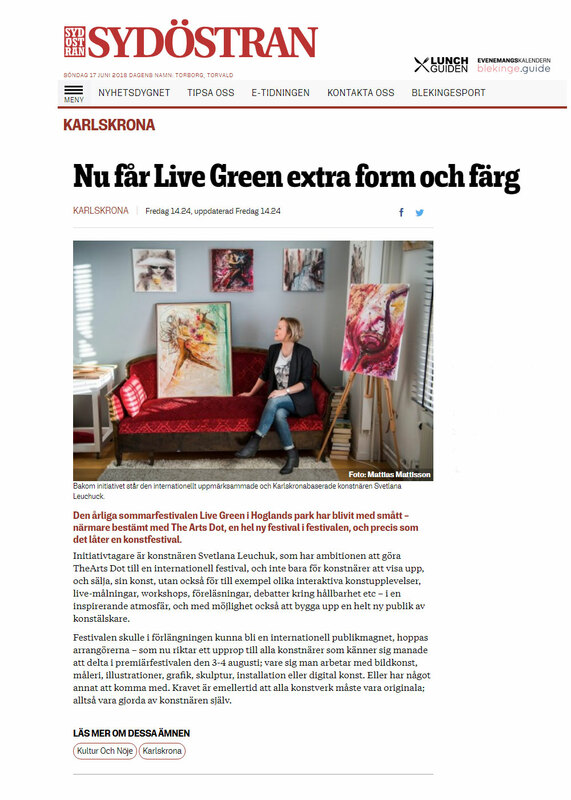 Commersen newspaper, Sweden. 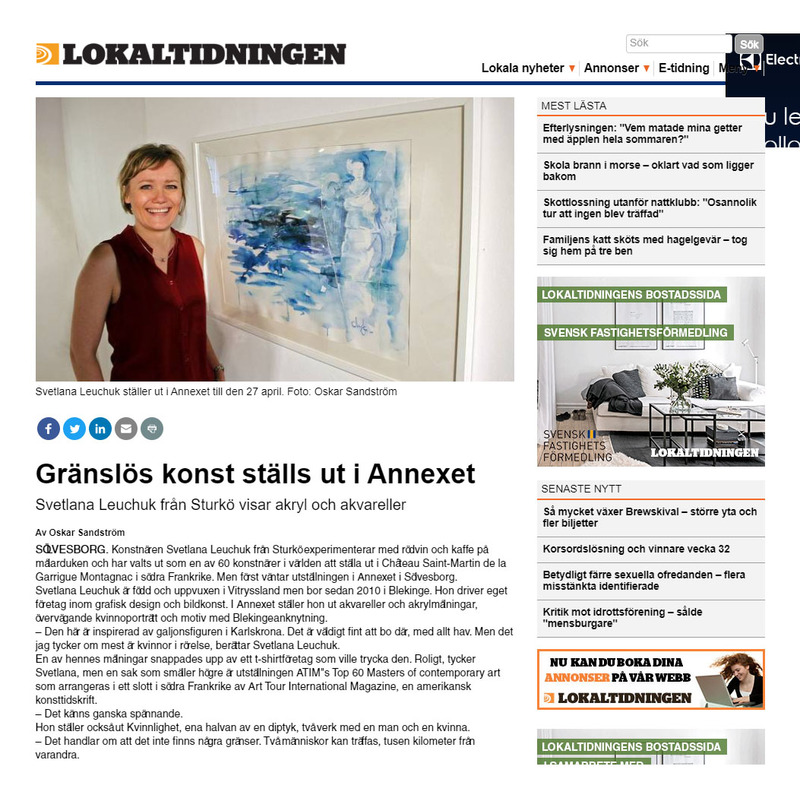 «Art without borders is exhibited at the Annexet». 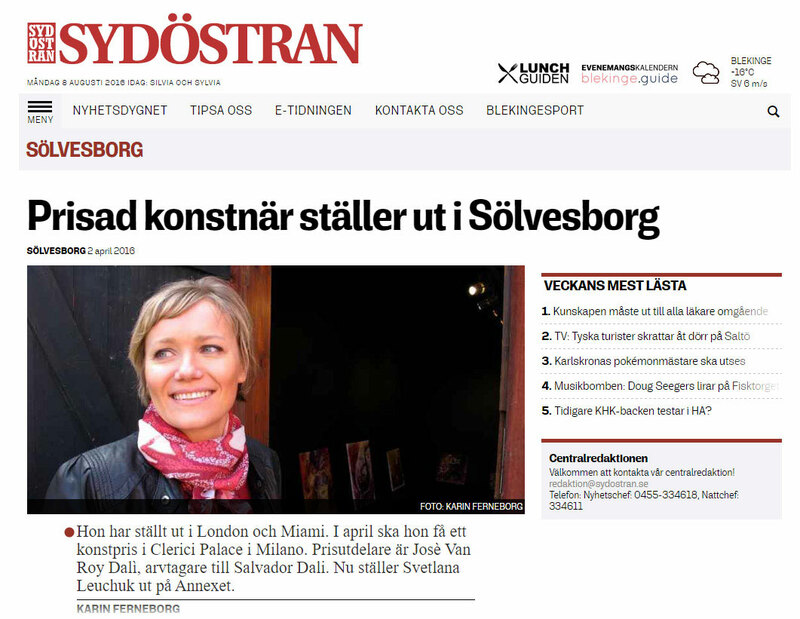 Sydöstran Sölvesvorg newspaper, Sweden. 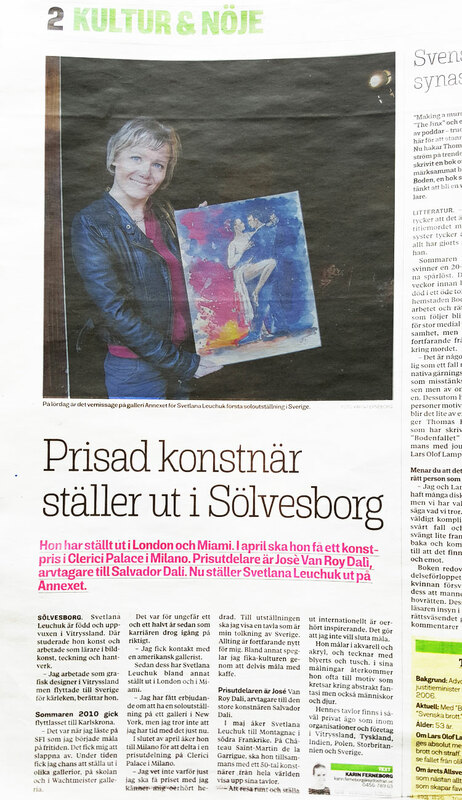 «Award-winning artist exhibits in Sölvesborg», April 2. BLT, Sweden. 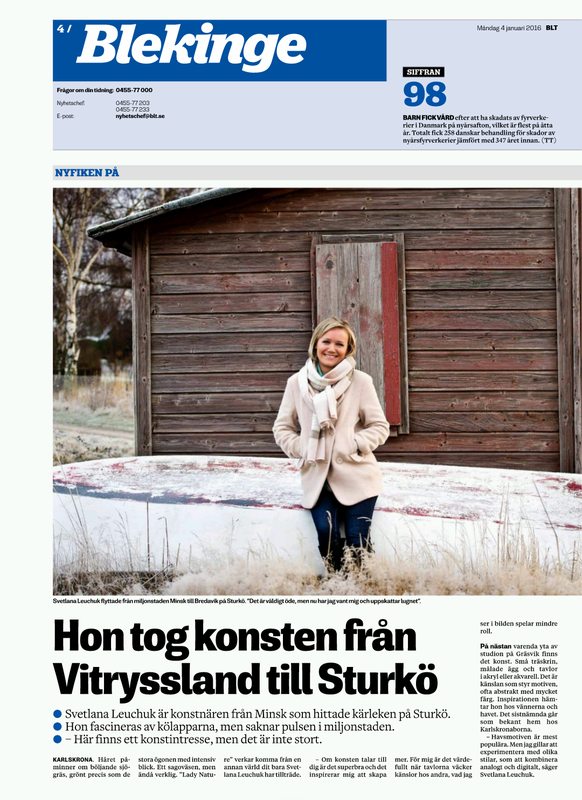 «She took art from Belarus to Sturkö». ArtTour International Magazine, New York, USA. 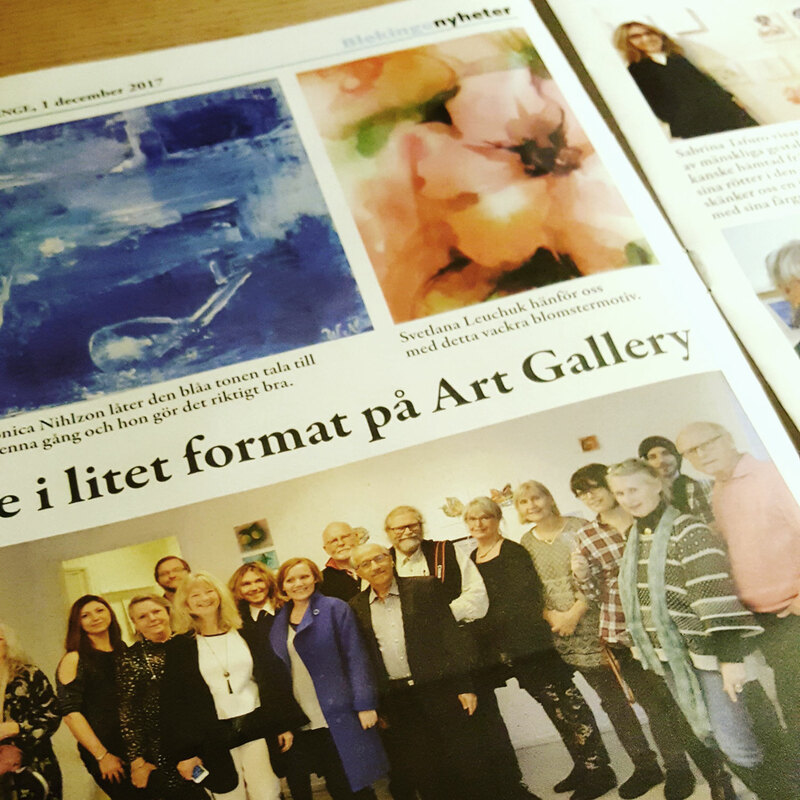 WINTER ISSUE 2016. 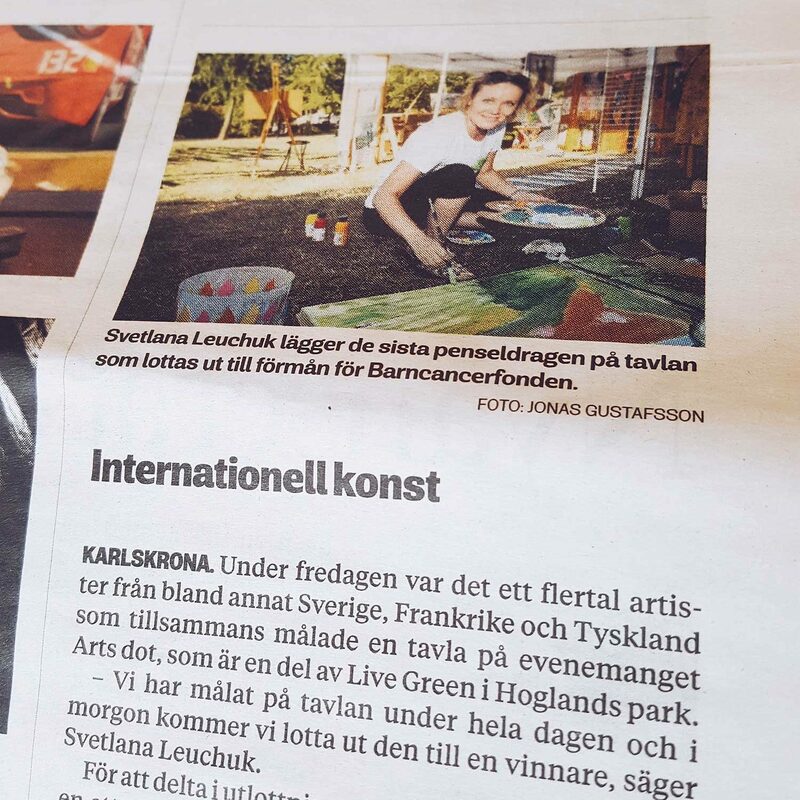 Commersen newspaper, Sweden. 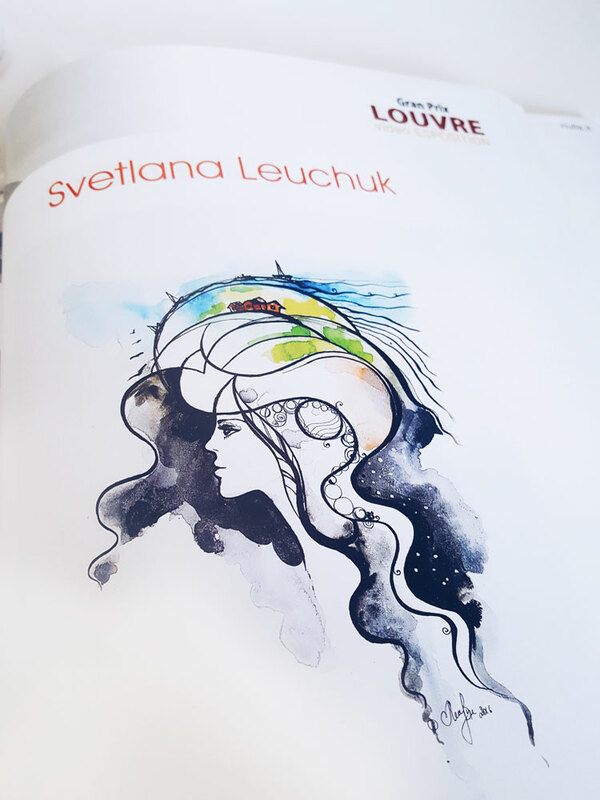 «Svetlana shows her art in Miami». South Baltic Storyville Storybook, Interreg South Baltic, Gdańsk, Poland. 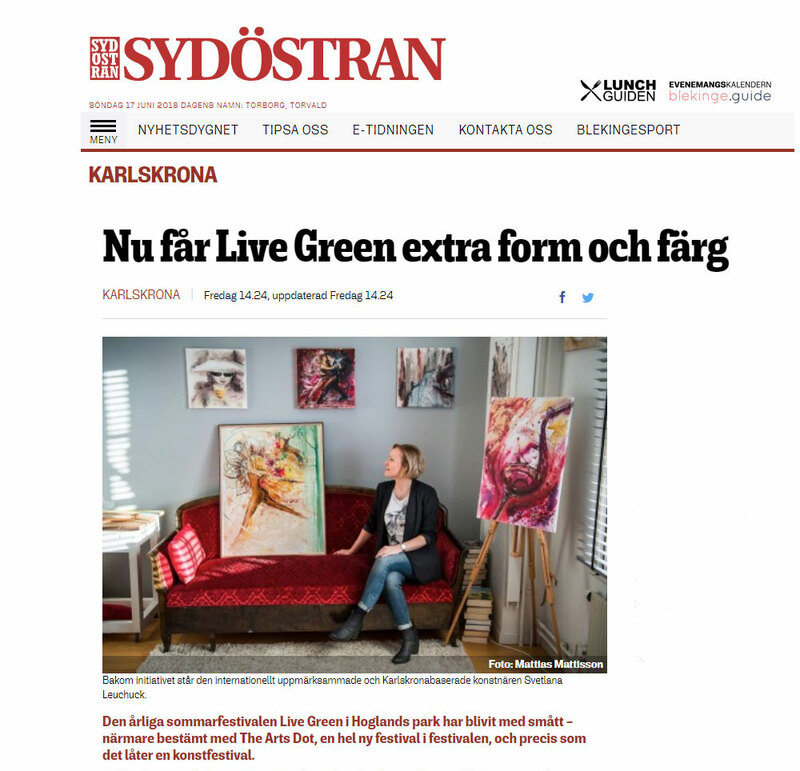 Swedish Illustrators & Graphic Designers 2016, Illustratörcentrum, Sweden. 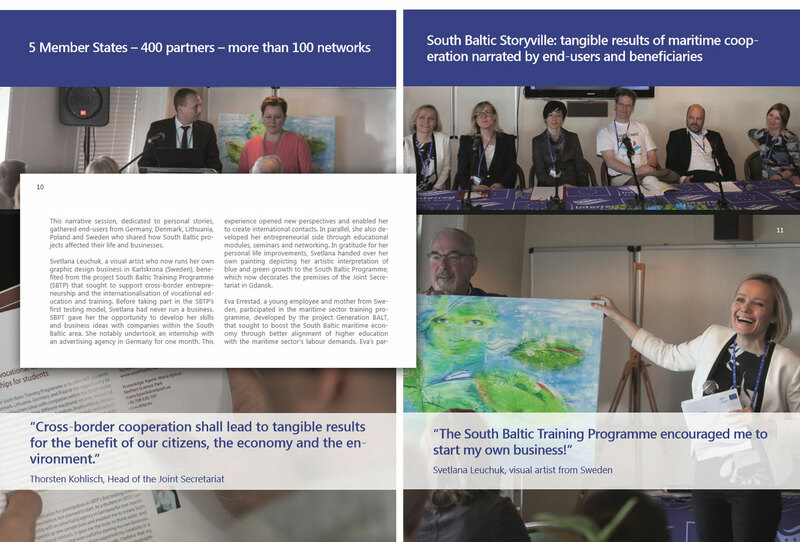 South Baltic Training Programme, book on issuu. 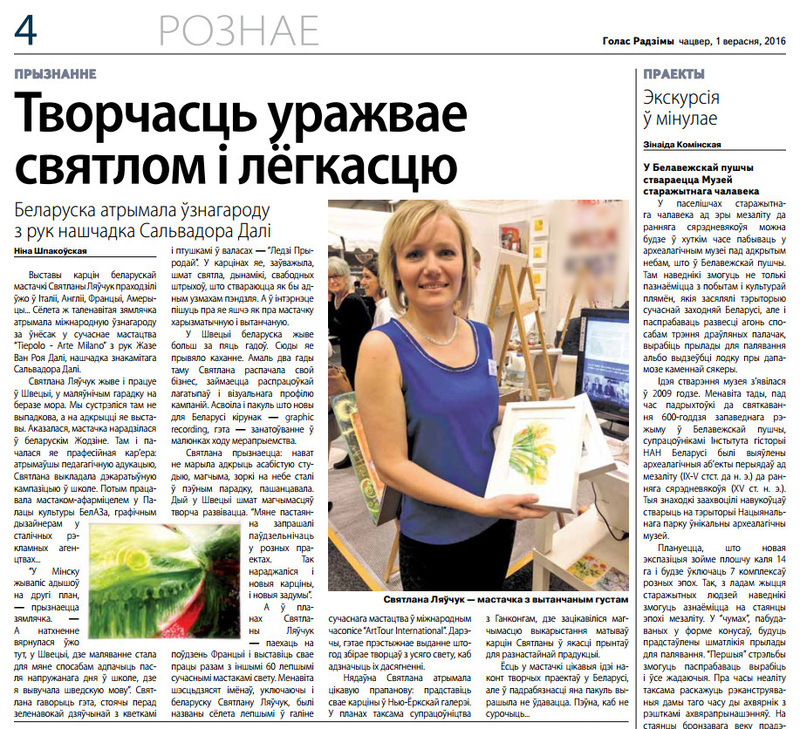 «From student participant to company owner», pages 23-24, 28. 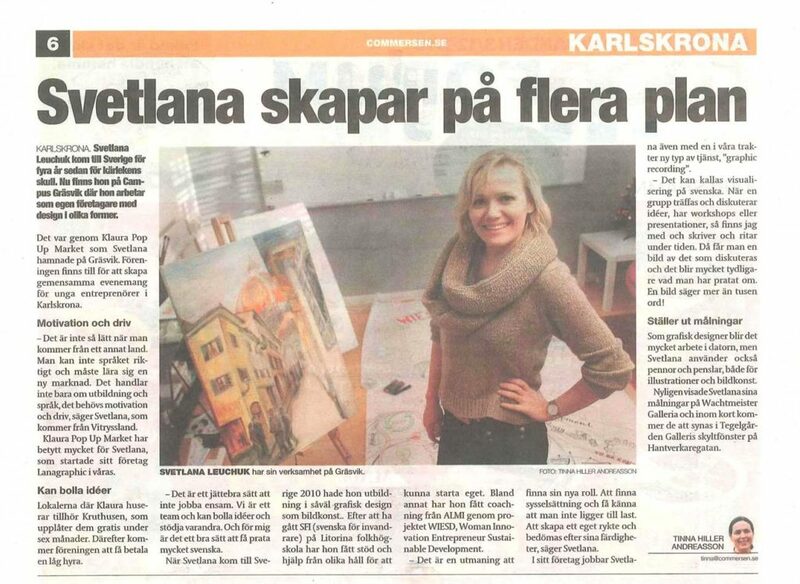 Art project Integration. 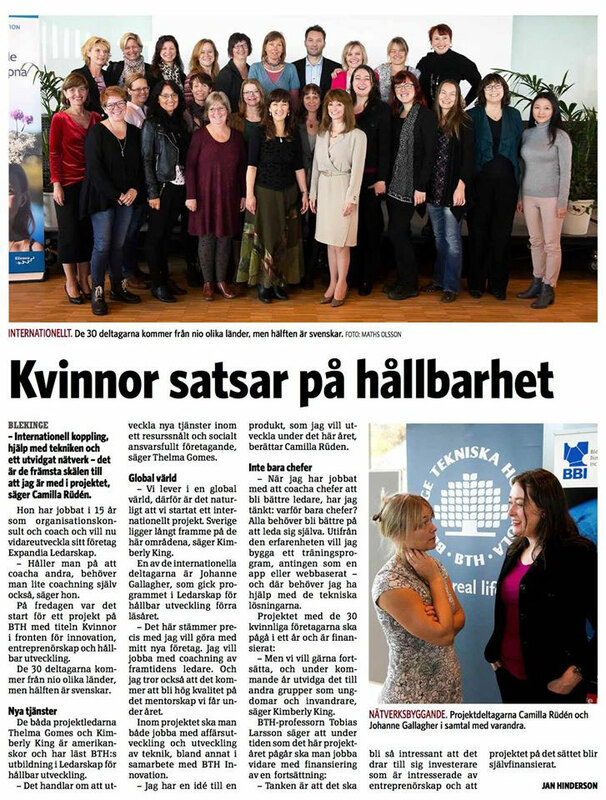 South Baltic Training Programme, Sweden. Sydöstran, Sweden. 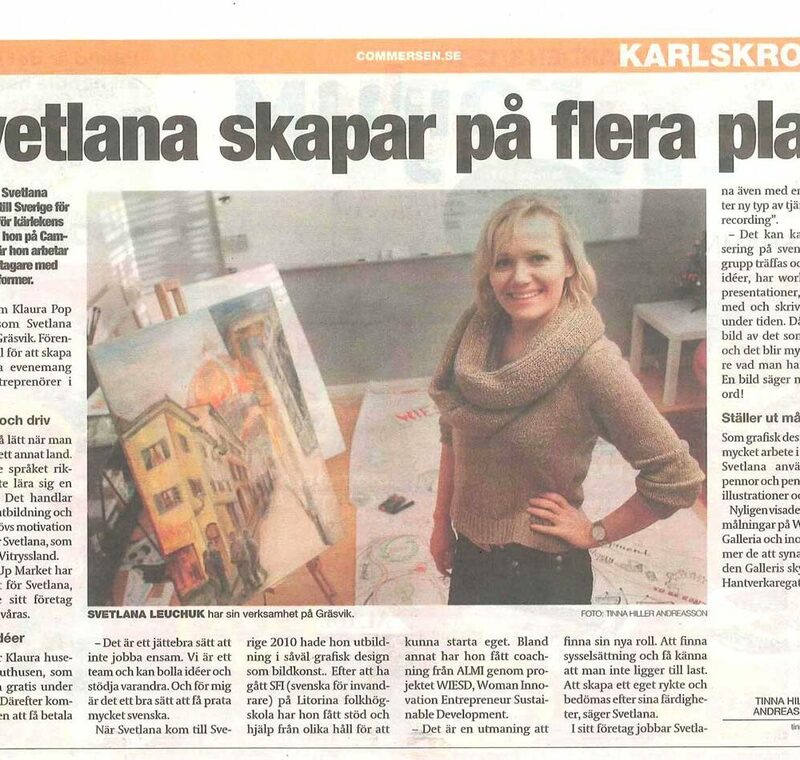 «NetPort project takes them into Europe». BLT, Sweden. «They travel to Germany for the three-week internship».